In & Out at Mogo - Kitchen shop for the serious cook! 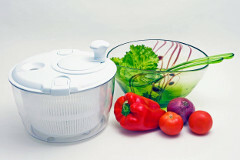 At In & Out at Mogo we sell quality kitchen gadgets and cookware. We also provide advice, product knowledge and friendly service. We believe that food should be an enjoyable experience from start to finish – choosing a recipe, finding the ingredients, preparing and cooking the food, and finally enjoying the meal. 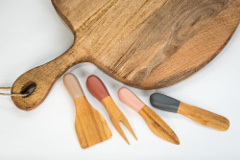 A huge range of quality knives and boards. Cookware including pots, frypans, paella pans, induction saucepans. Elegant and fun salt and pepper shakers. Silicon bakeware, spatulas and tins. Collanders, salad spinners, compost buckets and string shopping bags. Icing tools, icing and fondant. Reusable drink bottles and coffee mugs. 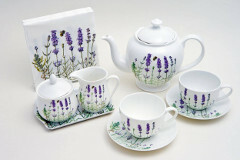 Large range of tea sets. Huge variety of cups and mugs. The largest range of hammocks and hammock chairs on the South Coast. Pasta machines, fondue sets, garlic presses, pizza paddles, thermometers, cooking cutters, micro planes, potato ricers, wine aerators and much more! Looking for something specific? Give us a call on (02) 4474 4980 and we’ll help you out – or contact us. Great food & superb coffee. Chocolates, mango drops, jelly beans and much more!